The Commons is under fire in Madrid, and we need help. To give you some context to understand what’s happening right now, we’re reposting this article written by Bernardo Gutiérrez, which originally appeared at Guerrilla Translation. 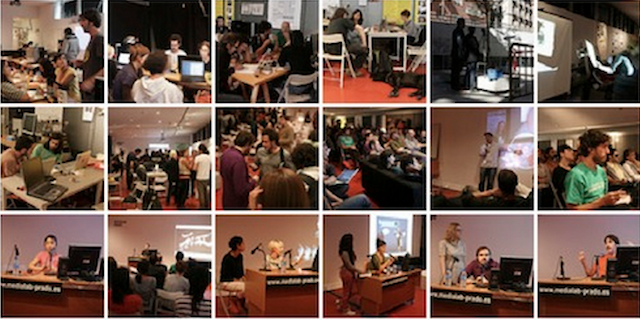 MediaLab-Prado, located here in Madrid, is on the cutting edge of investigative practises related to Free Culture and the Commons. It’s also one of the collaborative spaces where the initial gestalt of the 15M movement was born. 7 million Euros of public funds was invested by the local government in the rehabilitation of an historic building in Madrid (the Serrería Belga), in order to house MediaLab. 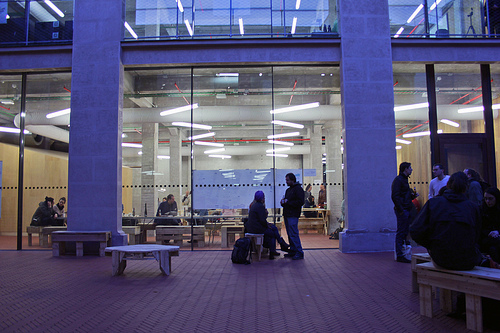 The building was leased as a public space for the development of the lab’s activities, projects and openly accessible workshops. On Friday, April 4th, Madrid’s local government’s plan was revealed. 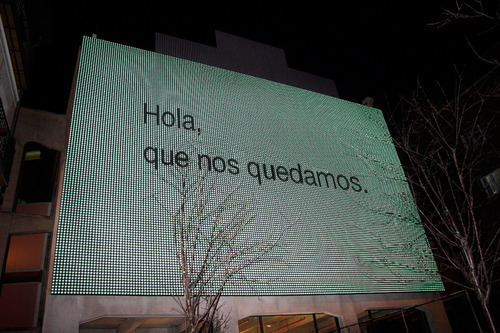 They intend to rent out this public space – again, paid for with public funds and for public use – to Telefónica. The irony is rich: Telefónica was Spain’s nationalised public telecommunications provider, later privatised in 1997 under the neo-liberal government of Jose María Aznar. Today, Telefónica is a private global telecommunications conglomerate, and the fifth-largest mobile network provider in the world. History repeats itself. With total opacity, the local government is evaluating Telefónica’s proposal. Obviously, Telefónica wants to hitch a ride on the emergent P2P revolution by having the building host its “Open Future” project – which, according to them, “will lead the third Industrial Revolution, the Digital Revolution”. This blatant appropriation – enclosure, if you will – of P2P-Commons movement rhetoric is yet another example of the dangers posed by Netarchical Capitalism’s encroachment on vital projects like MediaLab Prado. See what’s at stake. Read Bernardo’s article (below), and follow the updates on MediaLab’s newly created Twitter account for its defense: @savethelab. UPDATE: We’ve also published MediaLab’s call for help in this link. I was drawn to read this by a facebook post, suggesting an imminent closure of the Madrid lab, and I was sort of expecting some kind of a ‘call to action’ .. how can people help to keep Telefonica from taking the lab’s space ? “We need to show the City Council in clear terms that Medialab Prado is an important institution that is highly respected and valued internationally. One of the most ironic aspects of this situation is that given the problems they’ve always had to understand what is Medialab Prado -not being a museum, a gallery, or an arts production center- they have never been understood that this is one of the most influential and valued cultural institutions today in Madrid and Spain. 1. A statement or blog post in your own website explaining why you appreciate and value the role of MLP and showing your concern for how the current situation could threaten it. We will link to it and translate it from the website of support we are currently setting up, that should go live in the next hours. 2. For those of you with affiliations with universities, museums or companies, a signed letter of support with the logo of your organization. If you can send it to me I will get it into the website and also printed to send them all together to the City Council. But there is no email address. Where can people send those support letters? We’re trying to get in touch with José Luís to get a mailing or e-mail address (it may be the address of the Lab itself). I’ll update the post as soon as I can. I’ve just sent it, Silke. Give us a heads-up when it’s published. I was in Spain recently and notices many innovative ideas in the public sphere as I traveled about – particularly in the Bilbao area. I wonder how many of these ideas for living were sourced in a setting like Medialab Prado. The telephone company wanting the space for their “open future” project – What Cheek? – I’m gobsmacked.